Here are the official weigh-in results for UFC 168 tomorrow night, which will be hosted by the MGM Grand Garden Arena in Las Vegas, Nevada. 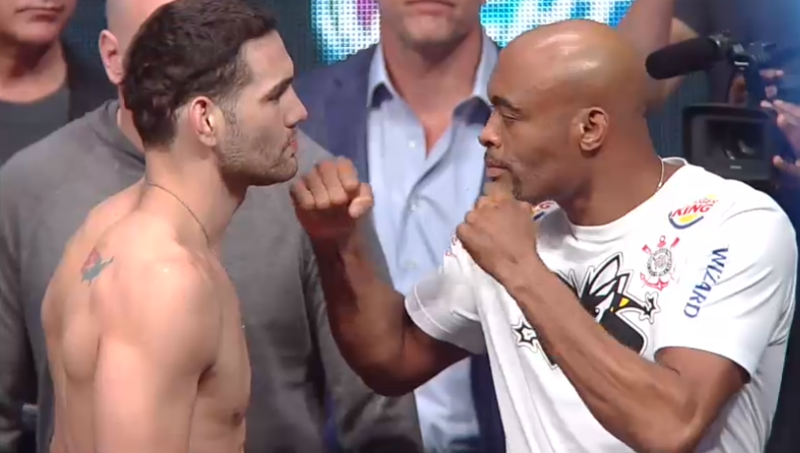 In the main event, Anderson Silva will attempt to regain the middleweight championship from Chris Weidman, who knocked out the legendary fighter at UFC 162. Silva came in at 185 pounds for the bout, while the champion tipped the scales at 184. In the co-headliner, Miesha Tate will attempt to avenge her previous submission loss to reigning bantamweight champ Ronda Rousey. Tate weighed in at 135 pounds for the fight, as did her rival Rousey. Diego Brandao came in seven pounds overweight for his featherweight fight with Dustin Poirier, by weighing in at 153. Poirier, meanwhile, weighed in at 146. UFC 168 will be hosted by the MGM Grand Garden Arena in Las Vegas, Nevada.